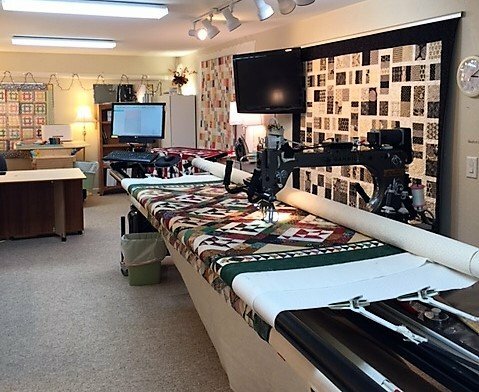 Pleasant Valley Creations offers affordable machine quilting services! I have been machine quilting since 1994. I continue to take classes to keep my skills new and fresh. Your quilt is very important to me and I treat them all like my own. My studio is clean, smoke free and pet free. If your quilt measures 60" x 80"
Multiply 60 x 80 = 4,800 square inches. There is a $6.00 thread charge. I have 110" wide Hobbs Poly-Down batting on the roll for $6.00 yd. This is a very nice Hobbs light weight batting. I also have Hobbs 97" wide 80/20 for $8.00 a yard if you prefer. You pay shipping both ways. Tax is charged only in Iowa. Please fill out the form below and send with your quilt. These are a few of my machine quilting designs. Click the links below to view or print. If you don't see what you like, contact me and I'll help you choose the special design for your quilt. Click here to print and fill out this form and send it with your quilt.